Thursday, May 3rd, 2018, 5:30 p.m.
Are you a fly-by-the-seat-of-your-pants writer? Hungry for a book that shows you how to write and revise your novel without an outline? 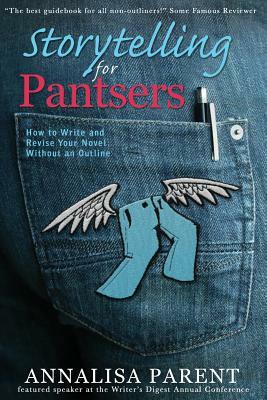 Discover the secret sauce to help those of us seat-flyers get at least some grounding in what we do, and to find and use a system in the chaos that is pantsing, as we present Storytelling for Pantsers: How to Write and Revise Your Novel Without an Outline. Author and writing Coach Annalisa Parent will walk you through the elements of a publishable manuscript. Based on her decade-long career helping writers to publish, and a twenty-year writing career, she’ll pull back the curtain on some of the tricks of the trade. Jump around - You should read this book if you write chapter 1. And then chapter 5. And then chapter 2. etc. Get Lost in the Weeds - You should read this book if you get lost in the weeds of writing and revision because portions of your novel are in different phases of the writing process. Feel Writing is Complicated - You should read this book if you feel frustrated because "Dang it; writing's hard enough. Why do I always have to complicate it?" Are you a fly-by-the-seat-of-your-pants writer? Hungry for a book that shows you how to write and revise your novel without an outline? and to find and use a system in the chaos that is pantsing.